Any individual that finds themselves searching for a party bus in Pinckney can now rest assured that they have found what they are looking for. Here at Rockstarz Limousine and Party Bus, we specialise in not only delivering an amazing time for you and your guests, but we can guarantee that you will be blown away by the quality of our customer service. Whenever you want to rent a party bus, it makes sense that you have a number of concerns that will then need to be addressed. One major issue is the space that is available, but we want you to invite as many guests as possible which is why we have tried to make the best use of the space on the bus. As a result, even more people than ever before can accompany you. Our Pinckney party bus rental service is also designed to give you and your guests the feeling that you are indeed experiencing something special. This becomes apparent from the moment you step on board as you will all be blown away by the atmosphere that is generated. From the sound system, to the light display, you will immediately feel as if you are in your own private nightclub cruising around the city. 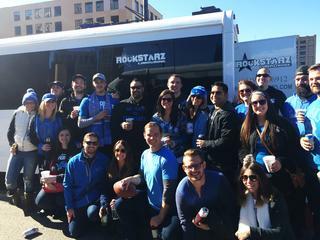 Previously, individuals have used our Pinckney party bus service for a whole host of occasions. No matter if you are looking at a birthday, a special anniversary, or maybe you are getting married and looking for a location for your bachelor or bachelorette party, we can help. After all, our own aim is to give you the location to have that brilliant party. So, if you live in the Pinckney area and are looking for a party bus, then give us a call here at Rockstarz Limousine and Party Bus. The other option is to contact us via our website and someone will be in touch as soon as possible to discuss your own individual requirements.